Doc, will he get a game ? Emre Chan did the same, he doesn’t play that much. Its the money thats all. Elle – he should, yes. Juve are planning to sell a few players this summer and he can easily enter the 1st 11. As for Can, he actually scored yesterday. He was injured, than slowly introduced as a sub mostly and now Allegri is starting to use him more and more in different positions (from DMC to AMC) as he allows Pjanic to do his job more easily. He was never gonna enter the 1st 11 easily as he was not brought for that purpose. The plan was to bring him in January in order for him to get used to the Italian style of play in this second half of the year, as one of Khedira or Benatia will leave next summer – so he can take over next year. Not overly impressed with his performances so far as he had a very poor start, but I still think he is a steal for the money and expect him to be better and better with time. What are everyone’s thoughts on Aguero? I was planning on selling him for Aub due to the BGW, but just suggested this to my friend and he asked if I was mad for considering it (lol) and that I should just bench him for a week. Are people generally keeping or selling? I get the swap argument but I don’t fancy wasting two transfers on him. If you were otherwise content with your team, and didn’t intend to make a change next week, could you be tempted to transfer him out now and back in next week? My worry is that when you go to bring him back in, you may have other issues to deal with. It’s never usually as easy as ‘in and out’ I find. I’m agreeing with GP on this. I’d also agree with GP. However, I’ll probably bring Auba in for Kun this week and switch back next week. It will all depend on how my team is shaping up for BGW31. 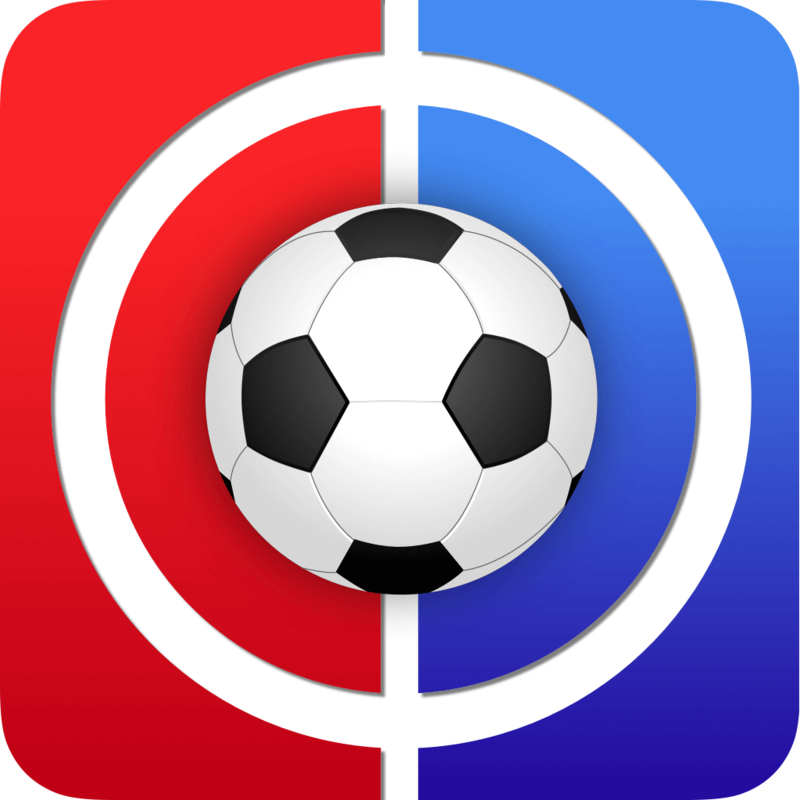 If you had transfers spare, would you be willing to use them to sell this week then bring back the following one? Already swapped him last week for Auba cos I’m a massive Bell end! Although I would still swap him this week for Auba … see first comment for my reliability in said matters! I’m otherwise content with my team and baring any injuries, don’t need to make changes next week. After the UCL would be the best time to worry about Kun-Aguero. If he get injured sell, if he come out healthy I will bench with the form he is in. 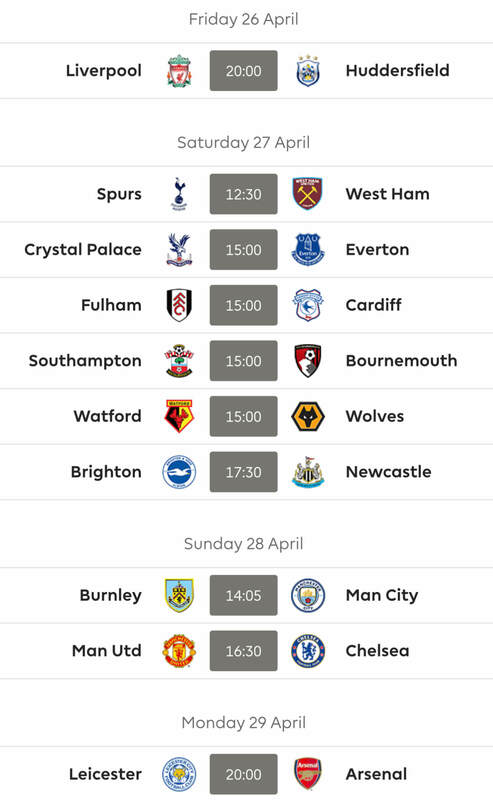 TBH if you want to use a one week punt to bring Aub and back to Kun for GW 28 it’s your FT to do with. Good luck with what ever you choose mate. Planning on benching but things could change between now and the next deadline. At the moment I’m going to do the swap. Would have done it this week but for Auba’s sniffles. Obviously if my side is plagued with injuries before the deadline I’ll reconsider. I’m relaxed about the in one door out the next element to all this. Have three BGW players and a set of crummy fixtures for most of my XI. Auba as captain would be very handy. He’s also handy because a lot of managers have brought Kun in this week – hopefully for Auba. If it pans out like the inspired Walcott in for Richarlison gambit earlier in the season there will be much sobbing and soul-searching – from me, anyway. 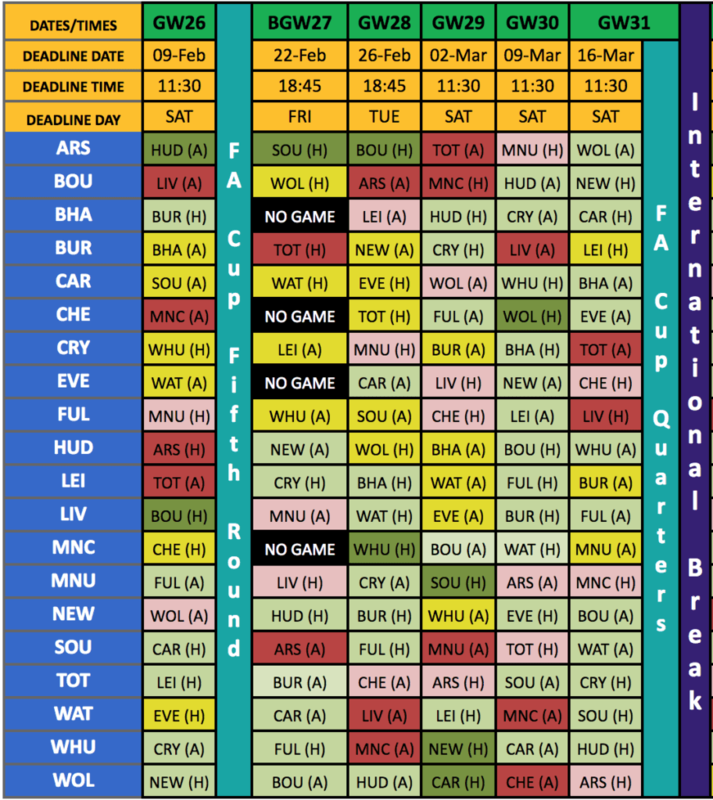 Can someone tell what the blank and double gameweeks will look like? Or probably will look like atleast… Or tell me where I can find such info. Blanks will be 27, 31 and 33. Doubles look likely to be 32 and 35. 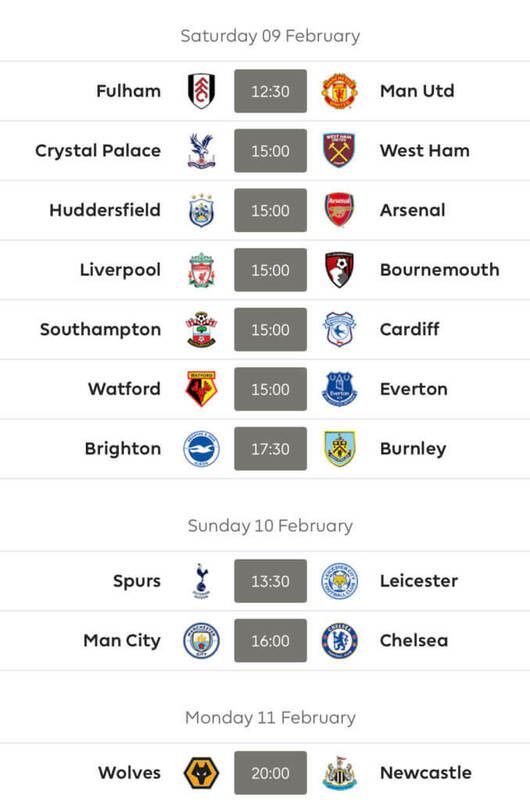 No DGW fixtures have been announced yet. Init will uz be doing an article on alternative chip strategies and when best to play them? Or is that just wishful thinking on my part? I’m sure we will at some point Milbs. Mito did say he was working on a filler article this week and I didn’t actually ask what it was about I rather suspect it may be just that. By filler, I meant like ramblings, but when I saw your UCL article in the kitty and the diary I thought to myself, we good. We will surely touch on it as and when it is appropriate Milbs. I’ve got 2 free trades, Sergio Aguero (and Lil Danilo! <3) in my team, a one week road trip to do a massive long distance house move for friends, which spans over GWs 27 & 28 – so….have planned to use my FH chip, as I had always planned to swap out Kun for Auba in 27 and bring him back in for 28. Seeing as I will have my hands full ('Idle hands are the devil's playthings', I hear you all say! ), and a crummy 'dumbphone', that read FPL results, but produces heartbreak, tears and frustration if I try to do any FPL transfers, I think this is the safest move for me, in order to keep (what's left of…) my sanity intact! What do you all think???? P.S. You all get a free gawk (for only 80 pence!) at my current team, as it is linked to this post. Sorry, the dumbphone ‘reads results’. Bloody Australians who can’t speak the Queen’s English (massive ‘chunder’ here!!!!!) Ha ha ha! Oh forking shirts! ‘Self-imposed, self-imposed! I’m an imposter! I wouldn’t expend the FH chip just yet. Auba in and captained will hopefully see you well. You’re right of course! Will do as suggested. Road trip off – and anything is possible with 2 FTs! I think I would find it impossible to give up alcohol if I lived in France. Anyone have a go at their UCL team yet? Starts back up tomorrow! Yeah was just thinking about that, we’ve got a WC now right? Yup. Feels like a fresh start, no? Messi / Ronaldo / Aguero / Mbappe / Dzeko / Rashford / Lewandowski? Who have you lads got? Since we are on a WC, I might and try to start back up. Yeah and after having some bad weeks in FPL really feels good to play another game too! Mito — seems Real are getting back some form. Who’d be your picks? Looking at Benzema (slight injury worry?) or Junior, Vasquez or Casemeiro? @Sanchez, Benz should be ok, it was in the neck area and he is set to travel with the team. Casemiro is not set in stone in the xi, so I probably stay away for that reason. Llorente has impressed and Solari has taken to him, so it is debatable who starts. Vini looks great, but just know that he never gets a full game. 60-65 minutes. Usually does damage in that time, if he is cheap he be a good player to have for a switch. Lucas is like a sacrificial lamb to some degree, he chips in, but he does a lot of tracking and running off the ball. Benz plays like Firmino for Madrid, but scores a lot more. Ramos on pens. Vini is special and for the right price could be worth a gamble. I probably limit it to owning one of them 3 only. Thanks, Mito. Yeah, Benzema and Ramos seem like the safe bets for sure. You reckon they’ll keep a cleanie vs an Ajax side going through a poor run of from (tho they seemed to be flying last year)? Zed — Messi always right? Only worry is Barca weren’t playing that well against Atletic yesterday — seemed disjointed… Messi was playing deeper/playmaker a lot to try and get something going but the whole team seemed a bit off. Well, they got a bit of time between now and their CL tie against a decent Lyon side (Fekir, Dembele, Traore) so hopefully they get their magic back sooner rather than later. If Reguilon starts over Marcelo the clean sheet possibility certainly improves. The youngster is miles ahead of Marcelo from a defensive standpoint and he is a more traditional LB, nowhere near Marcelo on the attacking end but he makes our back line a lot stronger with only Ramos as the weak link in open play. That combo of Ramos and Marcelo on the same side gives me several heart attacks every time they play together. The numbers with Reguilon starting are ridiculous, I believe Madrid have won every game that he has started under Solari or at least that I can remember. Plus we are don’t allow a lot of goals with him in. Problem with getting one though is Solari could see an opportunity to play Marcelo there, we got some big games vs Barca coming up this month on top of the one we just played vs Barca and Atletico. @Zed, Inaki should have beat them yesterday, Barca did not play well, Coutinho really needs to go back to the PL. I thought Madrid outplayed them in the cup game the other day and that was at the shitehole they call a stadium. Granted, Messi came on in the 2nd half because he was nursing an injury, but they still look disjointed. I get Messi also, they won’t win the CL, they are not good enough, but I agree Messi for sure in fantasy. Nice analysis of Madrid, Mito. Thanks for that! Yeah, prolly get Messi, as out of all the players, he’s prolly defo hatrick material in any given game and you wouldn’t want to miss out! Messi, Aguero, Ronaldo then? Surely Aguero will start if he keeps his form/doesn;t get injured!? Tonight’s job that Sanchez. Got a small reminder article going up in the morning too. Yep it’s unlimited this week Zed. Nice team. Well set for the blank, given no injuries.